Reuters posted an article this morning saying that Prolonged aspirin use tied to reduced colon cancer risk. While that is true, after all it is a very powerful anti-inflammatory as well as great analgesic. BUT, this problem with daily usage is that it is hard on the stomach, especially considered that most Americans suffer from Leaky Gut and do not have great gut health. So, is there a better answer. Of course! We can eat an anti-inflammatory diet; no gluten, drastically lowering or eliminating grains, avoiding all soy (except edamame), limiting red meat, ALWAYS eating organic, only eating organic or grass fed meats and keeping the body in a healing, alkaline state buy eating lots of fruit and veggies (2/3 of your days food intake). THAT is the way to stay healthy and meet our nutrient needs. But, what about when we don’t or our risk factors are high, we are stressed, we need to heal? Use quercetin instead of aspirin. It is a very powerful anti-inflammatory and great analgesic. For me it works better than Tylenol. It is inexpensive and easy to come by. Back in 1982, Durk Pearson and Sandy Shaw wrote about the benefits of a plant enzyme called bromelain in their best-seller book Life Extension. Derived from pineapple stems, bromelain is finally gaining recognition for its natural pain-relieving effects. Scientists have recently shown that bromelain provides powerful anti-inflammatory properties without the problems associated with drug therapy. Quercetin also has the ability to help prevent cancer and other inflammatory diseases. Pain reliever drugs can be prescribed or bought over-the-counter, but chronic use can lead to side effects such as gastric ulcers and liver-kidney damage. Bromelain has long been known to contain powerful proteolytic (protein-digesting) enzymes, which are beneficial in digestive enhancement. New studies reveal that enteric-coated bromelain provides potent systemic anti-inflammatory effects. In addition to its potent anti-inflammatory effects, scientists have recently discovered that bromelain exhibits tumor-fighting properties which are now being explored in the hope of finding a new anti-cancer drug. Numerous studies have shown that bromelain can be as effective as anti-inflammatory drugs for dealing with the pain of osteoarthritis.1 Direct head-to-head trials have demonstrated greater levels of improvement and decreased dependency on pharmaceuticals with bromelain. Growing evidence of the cardiovascular and gastrointestinal risks associated with non-steroidal anti-inflammatory (NSAID) drugs has left many people seeking safe, effective strategies for relieving pain and inflammation. Derived from the pineapple plant, the protein-digesting enzyme bromelain demonstrates powerful effects in alleviating pain, swelling, and inflammation. 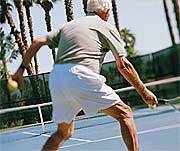 In clinical trials, bromelain-based formulations were more effective than an NSAID drug in relieving arthritis pain. Supplementing with bromelain-based formulations after injury or surgery also speeds healing and reduces pain. Bromelain hastens the resolution of sinusitis, and shows promise in fighting inflammatory bowel disorders. Preliminary studies suggest that bromelain may even help fight cancer. Experts suggest consuming bromelain between meals to capture its anti-inflammatory benefits. To promote healthy digestive function, take bromelain with meals. Bromelain’s anti-inflammatory properties have led to its main recognized medicinal use – as an effective pain reliever and healing aid in the treatment of minor injuries, such as sprains, strains, and other trauma. Scientists have also investigated the efficacy of bromelain in offering welcome relief from sinusitis, the painful inflammation of the sinus cavities typically caused by bacterial, fungal, or viral infection. Sinusitis often follows an upper respiratory infection and can manifest with symptoms such as nasal congestion and discharge, postnasal drip, headache, cough, and sore throat. A recent research review noted that bromelain may offer benefits for sinus health by thinning nasal secretions and inhibiting the production of inflammatory prostaglandins.13 In fact, the German Commission E has approved bromelain for the treatment of sinus and nasal swelling following ear, nose, and throat surgery or trauma. Preliminary findings suggest that bromelain may also have applications in the management of the inflammatory bowel disease ulcerative colitis, which is characterized by abdominal cramping and pain, diarrhea, and weight loss. Perhaps the most exciting news about bromelain comes from the front lines of cancer research. Several studies suggest that bromelain may hold an important role as a novel anticancer therapy. The evidence of bromelain’s efficacy is based on studies of its use as nutritional supplement, extracted from the stems of the pineapple plant. Although pineapple is a healthful food, it is not practical to acquire therapeutic amounts of bromelain merely by consuming pineapple fruit. A wide range of dosing recommendations exists for bromelain. For adults, the German Commission E recommends 80-320 mg of bromelain, two to three times per day.18 Other scientists have noted that the typical oral bromelain dosage is within the range of 500-1,000 mg per day, with up to 2,000 mg/day commonly used.13For delayed-onset muscle soreness following an intense exercise regime, 300 mg of bromelain three times daily has been used.19 Scientists have noted that 200-400 mg of bromelain daily for 30 days is effective for mild acute knee pain.10 The protein-digesting potency of bromelain products is often measured in gelatin-digesting units (GDU) or in milk-clotting units (MCU). Experts generally advise consuming enteric-coated bromelain supplements to benefit from its anti-inflammatory effects. To enhance food digestion, non-coated bromelain tablets, powder, or capsules can be consumed along with other digestive enzymes, such as lipase and amylase, at meal time. Bromelain is a general name for a family of sulfur-containing, proteolytic (protein-digesting) enzymes obtained from the pineapple plant. 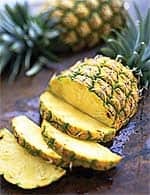 While bromelain is present in both the fruit and the stem of the pineapple, most commercially available bromelain today is extracted from the stem of the pineapple. Bromelain’s potent anti-inflammatory actions hold a broad spectrum of applications in human health. Not only can bromelain help relieve the pain and inflammation of sprains, injuries, arthritis, and surgery, but intriguing evidence points to its value in alleviating sinusitis and inflammatory bowel disease and even complementing anticancer therapies. This versatile, effective supplement promises to be a useful addition to every family’s medicine cupboard.